Renowned writer of 'Waiting to Exhale' brings her words to retreat's Under the Pines series. Torches lit the meandering path into the 400-acre estate at Yaddo one summer evening, where a magical night unfolded at the artist colony’s annual Summer Benefit. 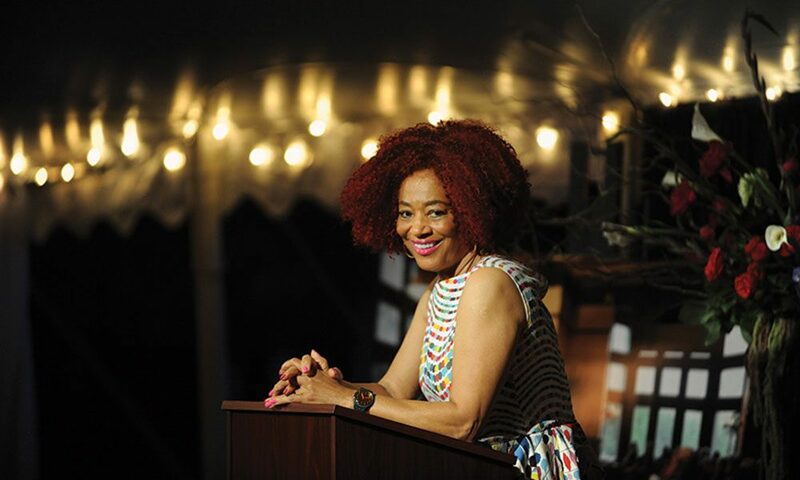 Set in a wooded glen behind the storied mansion, Under the Pines featured a reading with renowned author Terry McMillan against a backdrop of young deer flitting between cars as dragonflies skated across a pond. It couldn’t have been a finer celebration of the vitality of art and literature. In past years, the benefit has taken place in Yaddo’s 124-year-old mansion. Built in 1893, the stunning home has been the physical, aesthetic and for many, even the emotional anchor for the entire enterprise. The mansion is undergoing a multi-phased reconstruction, and reopening is targeted for summer 2019. So, this year, Yaddo took its moveable feast to a wooded glen behind the mansion. McMillan offered up the saucy, sometimes acerbic, always warm humor that defines her best-selling books, including Waiting to Exhale and How Stella Got Her Groove Back. But as a four-time Yaddo resident, she was quick to emphasize the unique place Yaddo holds for artists in America. As McMillan read from her chart-topping I Almost Forgot About You, a meditation on longing, friendship, love and ambition, she held the audience spellbound. Yaddo President Elaina Richardson sounded a charge to artists and those who support them. Yaddo, established in 1926 as a community to nurture artists, has hosted more than 6,500 residents who together have won a Nobel Prize, three Academy Awards, 74 Pulitzer Prizes and 500 Guggenheim Fellowships. Notable guests included Jay Rogoff and his wife, Penny Jolly; event chairwoman and board member Stacie Arpey; board members Lynn Freed, Mary-Beth Hughes and Peter Cameron; chairs Patricia Friesen and Michael and Marci Phinney; Evan and Mara deJonghe; Tom and Beth Flynn; Thomas Conboy; Madeline Chudy; and almost 300 others. The tent was arrayed with stunning flower arrangements from Lisa Kirkpatrick Clark and Brendan Flanigan, two well-stocked bars and a buffet overflowing with sweet and savory delights provided by Salt and Char, 15 Church, Osteria Danny and many others. Proceeds of almost $160,000 ensure that the residency program will continue to flourish – and that we will continue to feel the sweet gift of the hush of a summer evening.